Published on February 15th 2001 in Journal. 0 Comments Tags: 9-5, business-cards, celine-dion, DC101, music-industry. 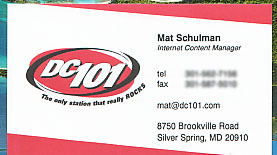 My DC101 business cards came in 2 weeks ago. Funny thing is, is they messed up my TITLE. The other funny thing is I approved the proof! Ooops. The 1st business cards came in as “Internet CONTACT Manager.” So I had to send them back to re-order them! My 2nd set of Business Cards came in tuesday. They read correctly “Internet CONTENT Manager.” It was an early VD gift. Or something. VD…love that one. So it’s official. My other job at Discovery was swanky and all, but this is dope. Be it is in the music industry and I get to do what I love doing. I get treated with a nice amount of respect and when I ask someone to do something. It actually gets done. The more interesting thing is that I have the opportunity to ask people to do things. I get to crack whips or something. I have also come to the conclusion that Limp Bizkit and bands of the sort don’t really exist. Well they exist in theory. But they are like molded out of chemicals built in a factory. They are built in the basement of the Record Labels in a factory. Other artists built here include but are not limited to: Celine Dion, Whitney Housten, El Debarge, Barbara Streisand, and/or any crooner. This also goes for actors as well including but not limited to: Bob Hope, Barbara Streisand (?! ), Tom Cruise, Julia Roberts, & Meg Ryan. I guess this list can be made for any genre of entertainment. But my theory can be proven. These people are not human. You should not get near these people. #1- They are all chemicals and smell really bad. #2- You could become one of them if you got too close. #3- Two words: Celine Dion! Come one now…would you want to see her naked! I am gonna have nightmares now! There are definately some people/things you just don’t want to see unclothed. P.S. If anyone has the CD (and can make “backup” copies) for Photoshop 5.5/6 could you please email me asap. I could make you a very happy person. I have a brass bed.